With more than 50 locations, quality health care is available close to home. If you are experiencing an emergency situation, such as chest pains, are in labor or have a serious injury, go directly to an Emergency Department. For more information, read Urgent care vs. emergency care from Shine365. Our hospitals provide 24-hour care for inpatient and outpatient services, emergency ambulance services, and home health & hospice service. 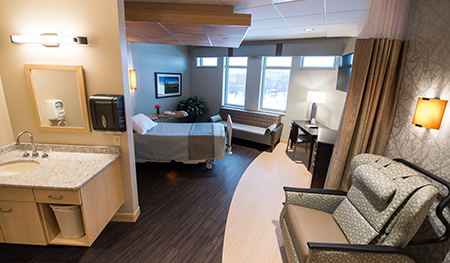 Patients who have been referred by their provider may qualify for a restful and comfortable surgical recovery experience in the spacious, private suites at Eau Claire, Wausau and Marshfield Centers. Learn more about the exceptional hospitality, care and amenities offered at Marshfield Clinic Comfort & Recovery Suites.